We are the Student Ministry of Grace Community Church in Clarksville, TN. We exist as a ministry for students from 6th-12th grade. Focused on helping students discover Real Life, which can only be found in a relationship with Jesus Christ. We know that everybody lives for something. Whatever we find to be most important is what we think is most relevant in life. The thoughts we have, the choices we make, the relationships we’re in, they’re all determined by what we live for. Many ideas compete for students’ attention and affection, but we know and believe that Jesus Christ is the One person who is relevant yesterday, today, and tomorrow. We all have questions. We all have things that plague us and keep us up at night with wonder. But often we have a few more serious questions. Questions like: What is the difference between gossiping and venting? Why is partying wrong? Does God give me a freewill to choose Him or reject Him? Is there a hell? Well we’re here to help. are meant to help us grow closer to our Savior. about our relationship with God. at 6 for Middle School and 7:30 for High School! 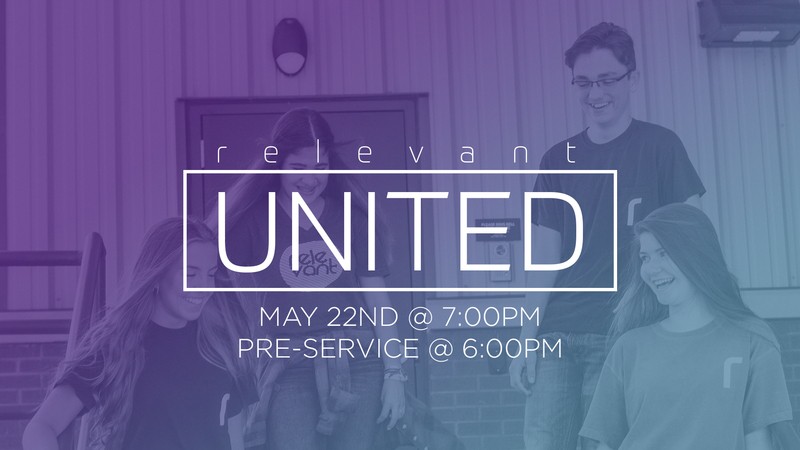 UNITED is a worship gathering for Middle and High Schoolers together! Join us as we spend time worshipping our incredible Savior. Sign up before it’s sold out! Check out weekly Relevant photos in our photo gallery!